Timber Oil Brand is a deep penetrating paraffin oil-based wood and deck stain. This stain dives deep into all exterior wood to condition the wood cells while preventing UV fading and water damage. TimberOil Brand is strongly suggested by the manufacturer for all new wood. Many wood and deck stains have difficulty with penetrating new exterior wood such as cedar, redwood, and especially pressure treated pine. Timber Oil Brand promises ease of application and proper penetration into new decking. Note: We tested the TimberOil Brand on a new cedar deck three weeks after installation. Only prepping was a light cleaning to remove the dirt. – The Timber Oil Brand looked even on our new cedar test deck. No overlapping or issues were apparent. The Honey Gold color was a rich “wet look”. The railings did not have any drips or runs. Penetration into the wood was 100% with no surface film or oily residue. – About 50% of the original color was left after 2 years. Wood looked more “natural”. – Timber Oil Brand had a slight amount of wearing on the railings otherwise, there were no issues. 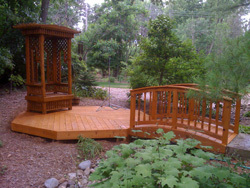 – We used 6 gallons of the Timber Oil Brand for our cedar deck. The cost was decent per gallon but square footage was a little on the low side. Not bad but average. About $.31 a foot. – Paraffin oils do not “feed” mold or mildew growth like other oil-based stains that contain linseed oil. Little to no mold was noticeable on the cedar. A small amount of algae around the railings. – Very very nice to apply! We were surprised at the ease of application on the new cedar. We applied the Timber Oil Brand with a garden sprayer then back wiped the excess with a pad applicator. At the time of application, there was puddling under the railings from overspray but this went away once dried. – No darkening for the Timber Oil Brand. Fades lightly while looking more natural. – Light cleaning to remove dirt and grime. No need to strip or sand. 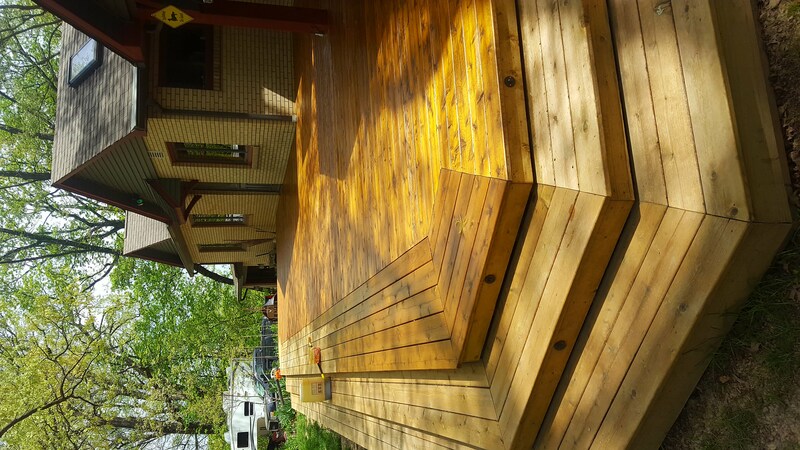 – If you have a new deck then Timber Oil Brand would be our top choice. Fades faster than some of the top stains but still lasts the normal benchmark of two years. Ease of application is plus. *All products tested and results are from our experience. We offer no guarantee of similar results. Take in consideration that results may differ due to different wood types, exposure to UV radiation, and natural weathering. Is Austrarian Oil stain avalible in quart size ? Does it come in a clear formula? 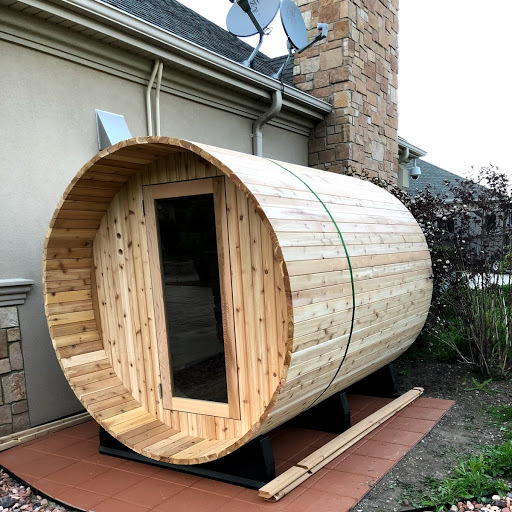 My wife is allergic to the off-gassing of the red cedar in our sauna. Will this product seal the wood? If not, can you recommend something else? It does not come in a clear. Try Defy Extreme Clear. I have used the Cabot Timber Oil semi transparent Natural. My question is the stairs did not stain well, how can I redo these ? or should I wait until next year and clean and then stain again. From what I read I only have to clean with no sanding and then stain with the same stain. I just stained yesterday, so I guess I am wondering what my options are without ruining it. Try leaving alone and clean and recoat in the Spring. We have a new deck installed about a month ago using cedar wood. I am not aware that we are not supposed to sand it before applying stain as it will not penetrate into the wood. What should we do to fix it? Should we wait until spring to stain it? What brand and type of stain should you recommend us to use? How fine if a grit did you sand? have a 12 yr old mahogany deck just power washed has had 3 seperate coats over the yrs it is very blotchy used mahogany flame bfore will the blotchy areas show thruanother round of mahogany flame love the look no time to sand down any recommendation would be appreciated . should i do a solid color? Strip it and brighten the wood. Apply Armstrong Clark in one of their hardwood colors. Do not use a solid stain on Mahogany wood. Just had a new cedar deck installed. Plan on waiting a month (NY) then staining. I’m guessing I will need to use a cleaner first? Is it ok to,use a regular brush and then a rag to apply or should I use a foam brush and then a rag? The deck is about 700 square feet with about 40 linear feet of railing. Any guesstimate as to,how much stain I will need? If i get 10 gallons is there any chance the leftover will be good for a reapplication? Use a cleaner and a wood brightener for the prep. Use a deck stain pad, not a foam pad. Better than a brush. No need for a rag. Only need one coat and 5-7 gallons should work. Yes. Strip and brighten for the prep when you switch. I recently had my deck added-on to, the decking is Trex but the railings are cedar. I now have a combination of 8 year old cedar (previously stained with Cabot transparent) and new wood. If I strip and brighten the old wood can I stain with Timber oil or will the color difference between old and new be too glaring and I should instead use a solid stain? We would go with the semi-transparent or semi-solid. It may be slightly off in color between new and old but will eventually blend. I have new cedar for a new deck. The wood has been sitting, not installed, for several months. I want a penetrating semitransparent oil stain, but I want a medium grey/charcoal color, and that seems to somehow be a hard thing to find in a quality oil based and semitransparent stain. The best stains don’t come in grey shades. Does anyone know the best oil based stain that does come in a semitransparent oil stain, medium grey? I obviously don’t mind if it fades to grey, but I do want a richness to it, good protection, and expect to have to reapply, but I had heard of a stain that really—stained, that is to say, people actually complain led that the color wouldn’t come out. I’d consider that to be ideal. Why would you want the cooor to come out? Now I can’t find the name. Thanks to anyone who has some input here. Try Amrstorng Clark in Driftwood Gray or TWP 200 Series in Slate Gary. No, they are not the same companies. You are looking at retailers sites, not the manufacturer. Very informative site. Thank you! I have a new cedar topped deck structurally built for a spa to sit on it. My plan is to wait a month, apply the Timber Oil, then place the tub. Any particular issues or advice on this? Reapplication will obviously be around and not under the tub. Thanks. I would like to maintain the color of this rustic western red cedar sauna. I need UV protection. I do not want to change the color. Transparent penetrating stain with UV for this new wood would TimberOil be a good choice? We built it about 1 week ago. How long should I wait to protect the color? I don’t want it to gray. Also, I’m hoping to not have to use a deck clean product etc to prepare if at all possible. Replacing rotted front porch ballasters and railing with PT pine. In SC, with high heat and humidity. The HOA requires a white finish. Could I use a stain or is it best to paint? If paint, then what primer? Also, replacing deck boards on porch not white, natural, where the railing was rotted. So I have a mix of old and new decking. I would prefer leaving natural but getting a stain to a consistent look will be difficult. Is a colored stain best for a uniform look? For a white, you will need a solid color stain, not a paint. Try Flood Solid Stains. We are currently installing a new deck and I am really worried because after only 4 days the first part of the deck that has been installed is already showing splitting on the top. The name of the wood is AC2 CedarTone Premium from Menards. We used screws to install but the splitting is all along the length of the boards. Should we stain it as soon as possible to stop the cracking or still wait. Please advise what product would be best. I do like the idea of a natural looking stain but splitting is why we got rid of the previous deck! We live in the Upper peninsula of Michigan deck gets afternoon sun, very humid and a ton of winter snow. You have to wait and splitting is normal in wood. Staining will not prevent this. Nothing will. Part of having a deck. I assume from everything I have read that a new deck should not be stained at least for a month or more depending on the satin ? I have a new pressured treated deck and fence before I stain with Timber Oil stain what deck cleaner and wood brightner product should I use ? My contractor is wanting to stain soon and the fence has been up since February however the deck has just been completed a week ago. Restore A Deck Wood Cleaner and Brightener. Hello, we are finishing a deck renovation in Georgia. The decking has been down since late September. Painters are telling me it should be fine to stain now. I like everything I’ve read on your website about the timber oil. I just want to clarify that since this is a brand new deck we should only put one coat of stain on it at this point? Everyone keeps telling me two coats but that does not seem to be the best solution for a new deck. Can you please just confirm this? And, is it OK to use a brush to apply? Just one coat this time. Make sure to clean and brighten the wood for the prep. Brush or stain pad applicator. Thank you for your response. I was rereading your article again and now I’m debating whether the woodrich timber oil would be better or the Armstrong clark brand mentioned? The deck is new in the sense that it has not been treated with any stain yet, however the deck boards have been down for 5 months now. Would the timber oil still be your top pick or the Armstrong? Thanks so much….your website is very informative! Hi Megan, either would work well at this point. The AC will give slightly better UV protection if you use a semi-transparent color. Hello, I am new here and have been reading articles and reviews, a little confused. I am installing a new Redwood Deck (as I type it is being constructed), I live in Central Point, OR. We have a good amount of rain and cooler temps, average highs 40-50 and lows can be 30’s or colder. We have a dry couple of weeks coming up but colder temps, I get good morning sun on deck till about noon, wanted to take advantage of dry wearther. I was recommended and sold “SuperDeck transparent Natural” by the lumber store and no mention of any waiting period. Only instructions I have on the bucket say 40-95 degree install temps. But reading the reviews, SuperDeck doesn’t seem to be a great overall choice? I am wondering if I should return and get something else??? From what I read I do need to use a brightener prior to staining whether now or later. I had planned on applying ASAP, but again reading articles I am rethinking, but would like to do something to protect (if needed) from our wet winter, not wanting to add color just preserve. I saw that the timber oil didn’t require as long of a waiting time, but details on using on new wood (Redwood) were not clear. Thank you for your help, in my overall shopping experiences reviews can be as confusing as they can be helpful. Yes, you should return it. Best to wait for a period of time for the new wood to season. For the prep, you need both a deck cleaner and a wood brightener. Timber Oil can be applied about 1 month after the weathering and prep. It is tinted (not clear). You must have tint in your deck stain if you want to prevent UV graying. I’m building two Adirondack chairs from Douglas Fir. Can I use Woodrich Timber Oil on furniture; sitting surfaces? We’ve just installed a new 400 sq ft cedar deck in central Vermont. Would we be better served by trying to finish with TO now, or wait through the fall, winter, and chilly spring until next year to apply TWP or AC? This is a great site and super service. Thank you for all it takes to keep it running! Either way would be fine. TO now after prep or wait and do it in the Spring. Using the TimberOil on new decks is a good idea. It is what we personally use on all new decks. I am replacing deck boards with Siberian Larch decking. Can I use this stain right away? Live in Rhode Island and deck gets partial sun and mostly shade. Wait about a month and prep with a deck cleaner and a wood brightener. Can you use this on old wood? I have a 4 year old western red cedar deck that was previously finished with Penofin. The covered area of deck still looks great minus normal wear. The portion that is not covered has an almost black appearance. Im going to pressure wash and then sand all deck surfaces and rails and posts. Will Timber Oil Brand work better than Penofin? We live in the PNW and I’m looking for a penetrator that will hold up for a longer period of time than Penofin and that won’t lose its color. Use a deck stain stripper will pressure wash and a wood brightener after. The Penofin “black” will come off much easier this way. Restore A Deck Stripper Kits work very well for this. TO Brand will not turn black like the Penofin does. Lasts about 2-3 years with minor fading. No thanks on the stripper. As I said I’m sanding all surfaces. So that tells me that who ever answered my first question likely wants me to spend more money, unneccesaliy. Waiting for sample of Timber oil. Stripping is much easier then sanding and is the better way to prep. Opens the wood pores when stripping as opposed to clsoing the wood pores when sanding. Not trying to make you spend “more” money. Just giving the proper advice based on many 1000s of deck restoration jobs over 20+ years. I have a brand new Alaskan Cedar deck going down, I live in Portland, Oregon, so we have months of rain and damp conditions. I just tried a Behr product from Home Depot, it did not absorb consistently, pooling in some areas, so I’m just using this for the underneath. Granted I have not used a cleaner on the wood, and it has not weathered any, so do not know if this would have made a difference or not. What is the recommended stain to use? I’m reading this article and looking at the Wood-Rich Timber oil. The company who sold me the wood are recommending Penofin. Anyone experience with new Alaskan Cedar in a wet climate? The Penofin has a tendency to turn black. We would not suggest it. There are reviews on this website about the issues with Penofin. 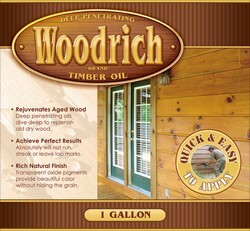 The Woodrich Timber Oil will work. You do have to prep the wood. We have installed pine boards on the deck floor. The deck has a covering roof, but the 2 ends are open. We are thinking of using SuperDeck stain on the deck. What do you think? Super Deck has a tendency to turn black on decks. We are not fans of the brand. How does Timberoil work on older decks? It works well for both new and older decks. The Restore A Deck Kits and pressure washing will work. Just applied 2nd coat in 3 &1/2 years. Very easy to apply. Cedar was allowed to weather for 1 year prior to first application. Cleaned and brightened and then applied stain. 2nd coat going on just after cleaning. Plan on repeating every 2-3 years. Very happy with results! Looks very sharp! Please tell me what color stain you selected. That looks like Warm Honey Gold. 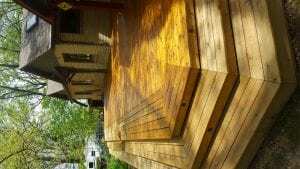 Need a recommendation – I have a 400-500 sq ft 20 yr old deck that we flipped the boards and they look really very good (in spite of being in the Houston area), then expanded the deck with new treated pine and replaced a few unsalvageable old boards. I'm going to pressure wash, clean and brighten the entire deck and posts. I intend to sell the house so need to finish the project pretty quick. Q1 – Will the timber oil finished look be fairly similar between the old and new boards? Q2 – I can wait about 2 weeks before staining – will that be ok? This may be a re-post since perhaps I didn't post the first time correctly. New and old wood will look slightly different when using a semi-transparent stain. You can wait 2 weeks but you will need to prep with a deck cleaner and a wood brightener. Hello! I would like to stain a new (3month old) redwood deck with a semitransparent stain that will give a rich brown color and not look reddish. Has anyone used the Brown Sugar color on redwood, and if so, does the final color have the effect I am looking for? Thanks! The Brown Sugar is not a rich brown but more of a medium brown with some cedar highlights. No red. Yes please this is a new ramp for a wheel chair/walker, PT wood, only one week old. Would stain make this slippery when it is wet?? This is a penetrating stain so not prone to being slippery when wet. Could you recommend a good brand of deck cleaner and brightener ? Restore A Deck cleaning kits. How can I remove mold on a newly stained & sealed red cedar decking ? It is nearly impossible to just remove the mold without having some kind of effect on the stain. Try soapy water and a very soft push broom. Where can I buy timber oil stain in North Carolina? No idea, contact the manufacturer for help with this. In the picture above for this review, were all components(bridge, etc) that we see stained with this product, or just the deck platform? I installed new cedar deck Aug 2015. I then used RAD cleaner and brighter and applied 1 coat of Woodrich TimberOil in late Sept.
Do I need to apply another coat of Woodrich TimberOil in 2016? If yes, should I wait at least 12 months? Also would I need to use RAD cleaner and brighter again or would a light cleanup such as water and brush be sufficient? Only apply if needed. Light wash to remove dirt and reapply one coat. If not needed, wait until next year. How should I determine if it's needed? Is it simply a matter of seeing if water beads up? Also how would you suggest I do a light wash? Should I just use water and a gentle scrub with a brush? It really is a visual and water beading or not does not determine. If it still looks good, then leave it alone for now. Installing new cedar deck in Northern MN and plan to use timber oil on it per most peoples recommendations. When I go to "re-stain" in a year or two should I keep using timber oil even though TWP seems to be a top choice? and if I do want to switch to TWP do I need to strip the timber oil off? Up to you. You can use the same or prep with a Restore A deck kit and use the TWP. I have a new cedar deck that will be completed this week. I plan on using TO as soon as possible – 3 weeks. I noticed in your review you waited three weeks and the only prep was a light cleaning to remove dirt. In the comments you recommended doing a cleaning and brightening to someone in the same situation as myself. I guess I'm just confused – do I need to do a full clean and brighten or can I just do a light cleaning like you did for the review? Great blog btw – thanks for all the great info! Full clean and brighten to remove the mill glaze is best. If I use timber oil to stain my deck. Do I need to use a clear sealer over the top? Or does the timber oil count for that? It is a sealer and a stain. You cannot apply anything on top of it. How many coats did you apply? We just finished a 700 sq. ft. deck 2 weeks ago. It is No. 2 prime kiln dried lumber. Is it okay to strain with this product in 2 weeks? Just one coat on new wood. You can apply now to your wood type. Okay. So, for a new deck you would recommend this or Armstrong-Clark? According to your article on new decks, AC suggests waiting 4 months before cleaning and brightening then staining. I am looking for something durable that hopefully you don't have to redo every year and they both seem to do that. Will probably be going with a darker brown color that is transparent as we want to see the grain. Semi-transparent hold up better I know but my wife doesn't think you will see had much grain. The first time you stain new wood it only lasts 12-18 months. After that you will get 2 years with either the AC or TimberOil. You can stain new woods sooner with the TO (about a month) then you can with the AC (about 3 months). Semi-trans show all the grain and do not mask the wood. Okay. Man you guys are great. How does the semi solid do with showing the grain? I thinks it's only offered in the AC but provides even better protection right? I noted that you said the semi trans would probably fade faster than the semi solid on the AC test deck so would that make it comparable to the TO semi trans? I think I'm starting to lean more toward the AC over the TO the more I read. You can't use one then use the other the next time without doing a bunch of work can you? Seems like the AC has more "additives" (that I can tell from both websites) than the TO to help with protection and longevity or is that not the case? I have ordered the sample kit from Woolrich which will save me $15 on a future purchase but if it took 6 gallons of TO compared to 2.5 of AC on your test decks (mine is 700 sf), might not be worth saving the money. Both products are easily removable with a stain stripper and pressure washing if you want to switch. No harder then cleaning the wood for the prep. The AC does seem to have more to it. Coverage for 1 coat of AC on 700 Sq. feet with a semi solid would be more like 4 gallons. More if you have railings and steps on top of this sq. footage. It would be best to remove all of the old stain first. I have a deck built with IPE Hardwood. Does your product work & how long should it retain the fresh look? Do you ship 2 gallons to a carton. Austin Tx area. John, this is not our product. We would suggest the Armstrong Clark Hardwood Stain or the Defy Hardwood stain for IPE. I've been pleased with this TO. I've got 2 cedar decks: 1 for our business (1 year old) and 2nd is at home (2.25 yrs old). I've used this timber oil on both of them, I'm currently applying it for the 1st time on the 1 yr old deck. My question would be, what should be next? Do I continue to use the TO, or at some point do I switch to a stain from same company? The older of the 2 decks had its 1st application applied about a month or 2 after install, and then a 2nd application 1 year ago. I'm cleaning the decks well before application with sodium carbonate (Oxiclean generic). Thanks for the help. If you are happy with it then stay with it. It is easy to apply and maintain down the road. Thank you. I am really ignorant to these things…. how often should TO be reapplied if using a quality product like Wood-Rich Brand? Every 2 years would be normal. Where can i buy this timber oil ?? Any experience with the Woodrich hardwood stain? Newly installed deck floor (one month); kiln dried Garapa. Was hoping to use Armstrong Clark in Amber but is turning a little too "orange" for my taste on the Garapa wood. Tested Woodrich Brown Sugar and like it much better but concerned that it will fade quicker on hardwood. Any advice would be appreciated? Yes we have used it before. It lasts okay for hardwoods. At most you will get about 1 year on a hardwood deck floor. Thanks! So I'm reading between the lines and thinking it should last just as long as any other hardwood stain as one year seems to be the rule of thumb. I was a little concerned since you rated their regular stains at a 5 on UV graying. Best is about one year. Some stains will last 3-6 months on hardwood decking. I would say that you will get somewhere between 6-12 months with the Woodrich Wiping stain. We are in Georgia and having a pressure treated pine deck and porch being built which should be completed in a week or two. The floor on the porch is tongue & groove (will be screened in with EZBreeze vinyl windows). Exterior side deck will get a ton of afternoon sun. If we wanted to stain by early December, is our best option TO for both the porch and deck floor? Should the tongue & groove flooring be cleaned with wood brightener too (before staining)? Is there any wait time needed for priming and painting the rest of the porch with acrylic paint? Thanks!! Yes the TO would be your best option and make sure to clean and brighten for the prep. As for the paint application, that depends on the brand you are planning on using as if you need to wait or how long. I would see what their directions say. Hi, I am a first time home owner and I don't have a deck, but what I do have is a brand new cedar fence. Is there any reason this will not work the same on a fence? I am sorry to ask here on a deck website, but this product seems to be exactly what I am looking for to treat and preserve my new fence. I am just so lost in a haze of oil, latex, solid, semi-transparent, clear, acrylic, alkyd, and a hundred other words you can use to describe stain that I really just need to find something already. So again I apologize if this is not the place to ask, but any advice would be greatly appreciated! You can use the same for fences and the good news is that deck stains on fences will last 2-3 times longer then on a deck. Use a penetrating semi-trans stain like Defy Extreme or the TWP. Thank you! You don't then suggest the TImberOil? I don't plan on giving it a lot of time to weather and according to the "Staining a new deck" article I read on this site, it suggested that the TimberOil would be best for new cedar. Timber Oil works well too. It does penetrate newer cedar better and sooner then other brands. Hi I'm in sort of the same situation with new western red cedar engineered siding. Was leNing toward the TWP, but I'm nervous about the wait for weathering as I don't want any weathered look, what did you end up using on your fence? Did you weather it before staining? We always weather and it is not a big deal. After the weathering you will need to prep and the at process will remove any dirt, oxidation, etc. Stay with the TO. Wood Tux will not penetrate the same and is a very different formula. After applying it can take a rain within 12-24 hours. Both the AC and TO are about the same. You cannot lighten a stain. It will lighten on its own though and should be a shade lighter in a week or two. I applied Timber Oil ( Brown sugar color ) 36 hours ago using a brush . It was applied to new cedar deck board. ( I gave the new deck board a rinse with garden hose 24 hours previous ). The stain is basically dry now but when i wipe across it with my fingers i get an oily film on them still. The weather is cool however . Approx temp 60 in the day and down near 35 at night. Do i just need some more drying time or did i do something wrong in the application procedure ? Thanks in advance. Did you wait a month after install and clean and brighten for the prep? It will dry so let it sit for now. The review on this site says the only prepping they did was a light cleaning so that is what i did with the garden hose to remove the loose dirt. The water did not bead or sit on top of the deck boards whatsoever so i read that mill glaze would not be an issue in that case. Light cleaning is not rinsing with a garden hose. You should use a deck cleaner and wood brightener if you have new wood as there always is mill glaze on new deck boards. My cedar deck is now at the 2 year mark. I stained the deck initially 2 months after building it, and then again 1 year later. So i left 2 of the questions asking about 2 year issues blank since the stain o my deck is only one year old now. I do remember noticing last year the stain was starting to wear off in the high traffic lane before re-staining. Now close to one year before staining again I do not see any of those issues. i may stain just the vertical boards again this Summer but it doesn't really appear that I need to. My main reason in selecting this stain was the ease of application, and thre recommendation for using on new decks. I am very happy with it, very easy to prep to application of this product. I have been using the color called "Brown Sugar" and we do like the look of it. I am very happy with it and will likely continue with this product, eventually if the appearance starts to go I will move to their darkest stain color.